If you have a weird, murky smell lingering in your car day after day, chances are that it is infected by mold. The bad news is, it is a persistent health risk and can multiply with a surprising speed. In order to get rid of mold in your car, you need to eliminate the root cause of the problem. According to PoisonControl, molds can irritate lungs and cause fatigue, headache, loss of memory, breathlessness, abdominal pain, and severe allergic reactions. In extreme cases, it may even cause death. Mold spores pose an equally threatening health risk. Needless to say, it is essential to get rid of mold on priority basis. Mold grows in the presence of both moisture and warmth. If you’ve parked your car on any picturesque beaches here in the UAE with the windows down, you’ve invited moisture into your car. Besides this, if you’ve spilled any liquids accidentally or your air conditioning unit hasn’t been serviced in a long time, the risk of mold is significantly heightened. Here’s what the HTRC suggest you should do in order to diagnose the problem and get rid of mold successfully. Tap sources of moisture: Before you start worrying about the smell and how to get rid of mold, inspect your car for unaddressed sources of moisture and fix it. It may be the window or the AC – get it completely checked to see moisture isn’t able to enter your car. Dry it up: Once you’ve fixed that, you need to dry up existing moisture. The best way to do this is to air the car on a sunny spot. Leave the doors and windows open to let the car breathe. Or you can try using moisture absorbents – which will be discussed in the next section. Locate the mold: If airing doesn’t eliminate the smell, it’s a sure indication of mold infestation. Now you need to figure out where the infestation resides. Check out every nook and corner of the car, particularly the carpets and the upholstery. 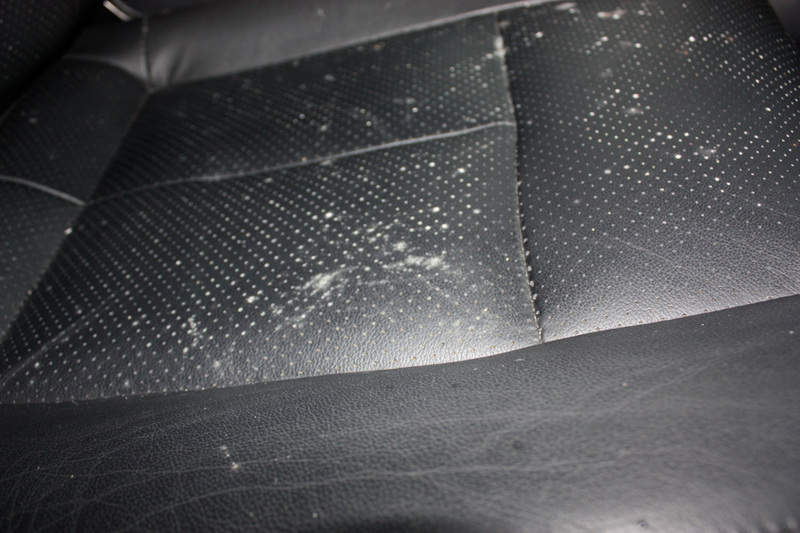 In severe cases, mold may be lodged into the foam of the car seats. Locate all possible areas that have been damaged. Scrape it off: You’ll be able to get rid of mold by scraping them. But be careful not to spread it, and always wear a face mask while doing so. Some of it will be ingrained on the surface, so you’ll need a different approach to tackle that. Here are some of the ways to get rid of mold effectively once you’ve scrapped off the surface. Baking soda can pick up moisture. Use it in copious amounts wherever mold or moisture exists. Leave for a couple of minutes and remove it via a vacuum cleaner. You might have to do it every few days to restrict the mold’s growth. According to HowToCleanStuff, this will help tackle the odor as well. Another way to tackle molds is to spray vinegar on them generously. However, this method is likely to leave a strong vinegar smell in its wake as noted by AutoGuide. Leave it on for 20 minutes and flush it out with a wet-dry vacuum. Vinegar eats mold and prevents spreading. If you’re not particularly allergic to the smell of vinegar, this method is worth trying. Commercially available carpet cleaners and shampoos are also a good way of removing mold in cars. Use them as per the instructions mentioned on the label. Scrub the infested area carefully and make sure you dry it out completely after cleaning to prevent reversion. Kitty litter, rice filled socks, and anhydrous calcium chloride, are some of the ways to absorb the moisture in your car, as suggested by WikiHow. Keep them stored strategically in your car, out of plain view, to continue protecting your car against mold. These techniques can discourage mold and solve an existing problem provided it is at an initial stage. If nothing else works or if the mold infestation is at an alarmingly advanced stage, it is better to employ the services of a professional. This would ensure the problem is addressed in its entirety.